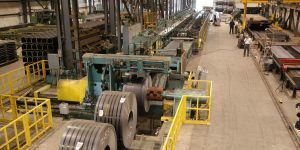 Metform has been a key contributor in developing industry expertise in heavy gauge roll forming technology. We pride ourselves in working together with our customers to design solutions for forming heavy gauge profiles that provide a stronger part and minimize welding in the fabrication process. We offer the ability to run from blank sheets or coils from material as thin as 0.157” (4mm) up to thicknesses of 0.625” (16mm). As a continuous process at room temperature, there is tremendous product design flexibility including pre-punching and notching to reduce downstream processes. Largest mill available with 600 horsepower to cold form up to 16mm heavy gauge sections.